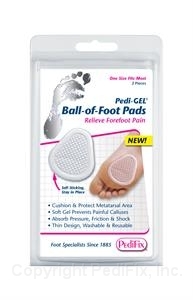 Soft Pedi-GEL® cushions and protects to relieve pain, prevent calluses and keep feet from sliding forward in shoes. Provides extra padding for thin-soled footwear. Durable, washable and reusable to provide months of comfort. Self-sticking pads adhere directly to feet or the inside of shoes. 2 per pack.